When scientists looked at Mars through early telescopes, they saw a fuzzy, rust-colored globe scored by mysterious dark gashes some believed were alien canals. Later, armed with sharper images, we scoffed at such naiveté. Mars is obviously dry as a bone and uninhabited. Now, with a great deal more information from rovers and satellites, we believe Mars was once wet. As for life? The jury’s still out. It shows how much we still have to learn (and are learning) about our solar system. Not too long ago, we only suspected one ocean of liquid water beyond Earth (on Europa). Now, thanks to robotic explorers, like NASA’s Dawn and Cassini missions, we’re finding evidence of oceans throughout the solar system. Why do astronomers care so much about water? As far as we know, water (especially liquid water) and life go hand in hand. This is one reason our hunt for exoplanets focuses on the “Goldilocks zone.” This orbital area is at just the right distance from a host star to allow liquid oceans like those found on Earth. 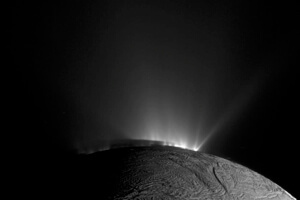 Geysers thought to originate in a subsurface sea erupt into space on Saturn’s moon Enceladus. But life, at least the simplest forms, may survive in more environments than once believed. Indeed, even on Earth, life is ubiquitous, from scalding volcanic vents to frozen wastes. And we may not, as it turns out, need to travel light years to find extraterrestrial oceans or observe our first alien life forms. The proverbial backyard may suffice. The potential for so much liquid water in our solar system recently led NASA’s chief scientist to declare, “I believe we are going to have strong indications of life beyond Earth in the next decade and definitive evidence in the next 10 to 20 years.” She isn’t expecting complex life. But news of even a few nearby alien microbes would expand the number of nooks and crannies life might inhabit throughout the galaxy. And there’s nothing quite like a good infographic to tie decades of research and exploration into a neat and pleasantly surprising bundle of education and perspective. Thank you NASA.